1. Heat up oil in a non stick kadai and mix in ginger and cook on medium heat. 2. Now when ginger turns light brown add garlic and green chilies and sauté. 3. Whisk Cashew nuts paste and fresh cream. 4. Add onions and bell peppers and cook until little soft and turn brown. 5. Now mix in cashew cream paste and stir very rigorously. 6. Now add tomato puree and ketchup and cook for 5-8 minutes with lid closed. 7. Add salt and red chili pepper. Stir fry it for 5 minutes and mix in sugar. 8. Mix in pineapple and stir till cooked. Low the flame now. 9. 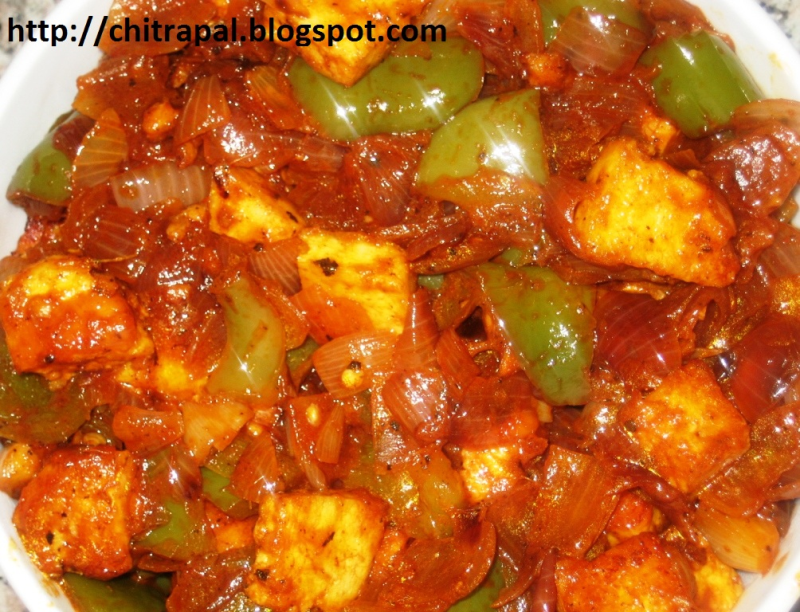 Mix in paneer cubes. Stir carefully so that cubes don’t fall apart. 10. Transfer to serving bowl and serve hot with tandoori roti.